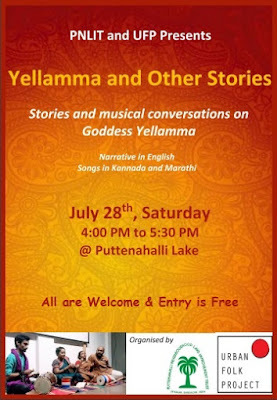 Experience a unique folk arts event of rare music, songs and stories from the hinterlands of India, right at your own neighbourhood lake. Place: Puttenahalli Lake, JP Nagar 7th Phase, Bangalore 560078. All are welcome. Do register your name by sending an email to sapana_rawat@yahoo.com. Urban Folk Project is a young collective working towards the collection of intangible culture across Karnataka, and exhibiting it in a contemporary context. More details about UFP may be seen on the website https://ufpbangalore.com/. The team of Shilpa Mudbi Kothakota, Adithya Kothakota and Sumithra Sunder tell the stories collected and compiled by UPF. The singers are collaborators who have chosen to learn these songs and instruments to help their artistic sensibilities and have joined UFP to exhibit these stories.The three instruments that will be used for the performance are the Shruti, Chowdki and Jaalra/Taala.